The Transports Exceptionnels have performed roughly 3,000 shows in public areas around the world! At the MINExpo 2008 in Las Vegas, Liebherr announced the R 9800 Mining Excava-tor. Rated at 800 tons of service weight the R 9800 provides a nominal bucket capacity of 38 to 42 m³ at a material density of 1,8 t/m³. This new flagship of Liebherr mining excavators’ range is targeting bucket loads of 75 tons in both versions, as a backhoe and a shovel execution. Liebherr is providing for the machine two engine options, two Cummins QSK 60 with a installed power of 1,492 kW / 2,000 hp each or two MTU 12V4000 with a installed power of 1,425 kW / 1,910 hp. Whilst the backhoe digging envelope and bucket width remain similar to the previous Liebherr flagship, the R 996, the R 9800 in backhoe configuration provides a break out force of 1,840 kN with a digging force of 1,750 kN. In shovel configuration, the machine is achieving crowd forces at ground level of 2,980 kN and breakout forces of 2,350 kN. These values ensure superior digging capabilities even in toughest mining conditions. The first units of the new flagship are currently in the final stages of factory testing and the first machine is soon due for operation in Australia. To get an idea of how big this excavator is, keep in mind that most excavators range from just under 2 tons up to over 100 tons. The ones you see on the side of the road probably weigh anywhere from 5-60 tons. In more practical terms, this 800 ton excavator weighs as much as approximately 100 full grown African elephants, or as much as approximately 15 Boeing Jets! The National Association of Heavy Equipment Training Schools (NAHETS) appeared in the September edition of Mining Magazine. 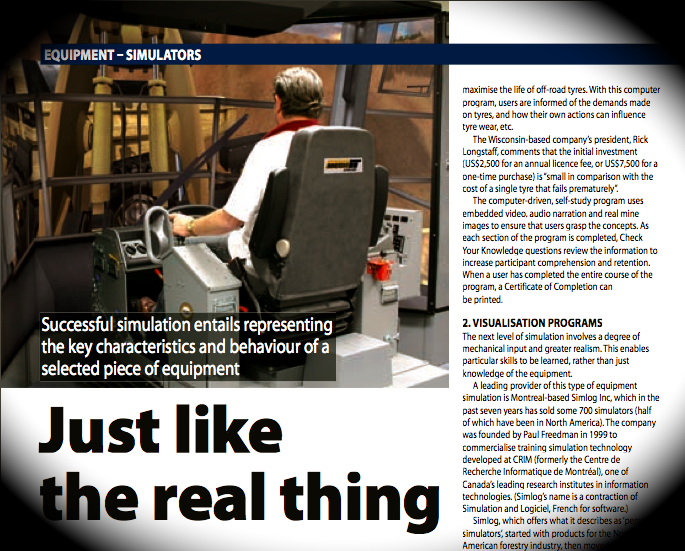 The article focuses on the use of various training simulators in the mining and heavy equipment industries; e.g., computer-based training, visualization, and advanced equipment simulators. These simulators improve safety and operating skills by successfully representing the characteristics and behaviors of various equipment types. Vista Training, Inc. and its cooperative, Simlog, are leading providers of the various simulators. All of the NAHETS campuses use simulators as part of their heavy equipment training programs. You can view the article in Mining Magazine…(pp.94-97).